Casa De Sonadores St John’s Finest Resort Villa Rental. No Resort or Hotel on St John can match this comfort. 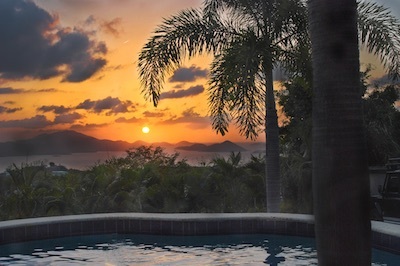 Experience the Best USVI Views on Earth! The Finest Custom designed St John Resort Villa. one bedroom on the main floor level and three on the upper level. Two have both indoor and outdoor showers and two have outdoor showers. All have comfortable king beds. The stone, travertine floors, and mahogany are exquisite. The round kitchen may be the most famous on the island and features all the best in luxury appliances. Carefully laid with handmade antique brick. No Resort or Hotel on St John can match this comfort, luxury, and privacy. Families share one roof, but enjoy unique, private decks from each bedroom, not seen from any other room in the resort villa. Lights of St Thomas are beautiful at night. The most stunning sunset you have ever seen. Only matched by The rainbows across the sea. From the main quarters, to the decks, to the outdoor showers, Casa De Sonadores - Private Resort Villa on St John is without equal! Thanksgiving and Holiday rates are for up to 8 guests. Inquire for additional guests. We encourage Saturday turnover unless previously arranged. Please inquire via email if you wish a different arrival/return date. There is a 3% fee for credit card/PayPal transactions. Policy available by contacting owner when booking. 50% deposit is required for reservation. My husband and I brought our adult children and their significant others. The owner, John, was very responsive to my initial inquiry and follow up questions. We were greeted in St. John ferry dock by property manager, Henry, Henry was very kind, friendly and helpful. They did a great job in stocking our requested provisions. We felt very comfortable from the first time we met him. The home is gorgeous, with beautiful views of the surrounding islands. we spent our mornings on the patio having breakfast and several dinners outsider as well. Felt very safe on the island, with mostly very friendly islanders. a car is a must to get around in St. John ( we rented 2 jeeps at thrifty car rental in st Thomas and took car ferry across; fairly easy) . Home is equipped well with stereos in and outside, tv, kitchen appliances and plenty of dishware. My entire family said this was our best vacation ever. We will definitely be back.